“Fish don’t see race,” Ishama Monroe said on a recent morning as he flicked his rod from the front of the bass boat. Monroe, who is 44 and goes by “Ish,” had launched at dawn from the ramps on the outskirts of Orange, Texas, for the last of three practice days ahead of the 2018 Bass Pro Shops Bassmaster Elite at Sabine River Presented by Econo Lodge. It’s a mouthful of a name for a sporting event, but sponsorships are the bread and butter of the world’s most prestigious fishing tour. Monroe was one of two African-Americans in the 108-person field, and he’s the only black man who’s been a fixture at the top echelon of the sport for more than a decade. But he doesn’t make a big deal about the sport’s demographics. Monroe, stocky and just shy of 6 feet tall, was wearing a long-sleeved polyester shirt, athletic shorts and flip-flops on this sweltering June day. He was working a pedal on the bow that controlled his trolling motor, allowing him to glide along the shore of a small tributary off the main river. He aimed his lured hook with precision toward the shallow, murky waters that bass are known to prefer. Just moments ago, he had reeled in his first bass of the day, a two-pounder, which he quickly released back into the water. On the three practice days preceding the tournament in southeastern Texas, Monroe was visiting spots that proved fruitful in previous years and exploring a few new fishing holes. “But I’ve already got my game plan for tomorrow,” he said. The tournament format is simple. For two days, the entire field has from dawn (which came a few minutes after 6 a.m.) to 3 p.m. to catch and retain up to five bass of at least 12 inches in length. The fish are kept alive in the boats’ live wells and then weighed onshore in the afternoon before being returned, still alive, to the river. If an angler already has five fish and catches another one that’s bigger, he’s free to exchange it with one in the live well. After two days, the 50 anglers with the highest weight total move on to the payout stages of the competition. After the third day, the field is winnowed to 12 for the final day of the competition. The winner of Elite events gets $100,000. He has cashed numerous checks at unaffiliated tournaments and taken home even more in endorsements. 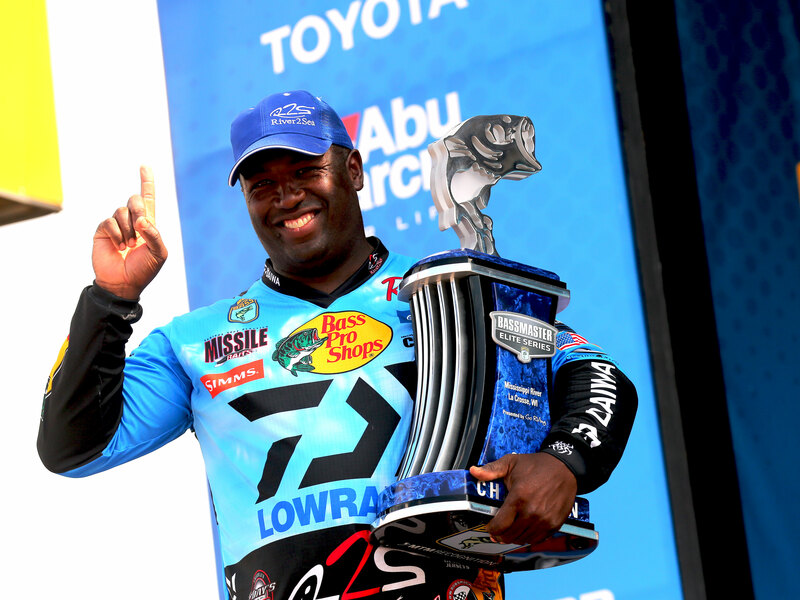 But it’s been more than six years since he’s won an Elite title; there are nine Elite events each year plus the Bassmaster Classic, the sport’s “world championship.” (Monroe fished in his first Classic in 2003, exactly 20 years after Alfred Williams became the first African-American to participate in the sport’s most prestigious event.) Monroe’s best year on the tour was in 2006, when he pocketed about $400,000. There are many AARP-eligible competitors on the tour, but Monroe said he envisions retiring at 50. Those who know him best dismiss such talk. They find it difficult to fathom that a man who skipped his high school prom and his sister’s wedding to attend bass tournaments, and a man whose sole hobby outside of bass fishing is saltwater fishing, would so easily walk away from a sport that’s been a lifelong obsession. Monroe (right) has won four Bassmaster titles and earned more than $1.5 million in prize money on the Bass Anglers Sportsman Society tour. Like prized jewelry, fishing is passed down through the generations. Gregory Simpson, Monroe’s father, introduced him to the sport at a young age, just as Simpson’s father had done for him. “But back when I was fishing with my father, we were fishing to put food on the table,” said Simpson, a retired firefighter. Monroe was born in Ann Arbor, Michigan, and Simpson first took his son fishing at the age of 2. “I’d hook the fish and let him reel it in,” Simpson said. Not long afterward, Monroe moved with his mother, Wanda Monroe, to California, and his father followed shortly after that. (Wanda Monroe and Simpson never married.) Monroe and his father fished for perch in San Francisco Bay. On rare days, Simpson would pull his son from school to fish. “I’d get a call over the intercom saying I had a dentist appointment, and I’d just smile because I knew what my dad was up to,” Monroe said. Monroe became fascinated by bass fishing “because that’s what he’d watch on television,” his father recalled. Professional bass fishing was the brainchild of an Alabama insurance salesman named Ray Scott. In 1967, while on a business trip to Mississippi, Scott was watching a basketball game on television when he had the idea that fishing would make a great televised sport. He hosted his first tournament in 1968 and shortly thereafter founded the Bass Anglers Sportsman Society (BASS). (Scott sold BASS in 1986, and it’s had two subsequent owners, including ESPN, which ran the organization from 2001 to 2010.) And while Scott was wrong about the sport’s television appeal — ratings always have been underwhelming — the sport has been sustained by its close ties to the $50 billion domestic recreational fishing industry. 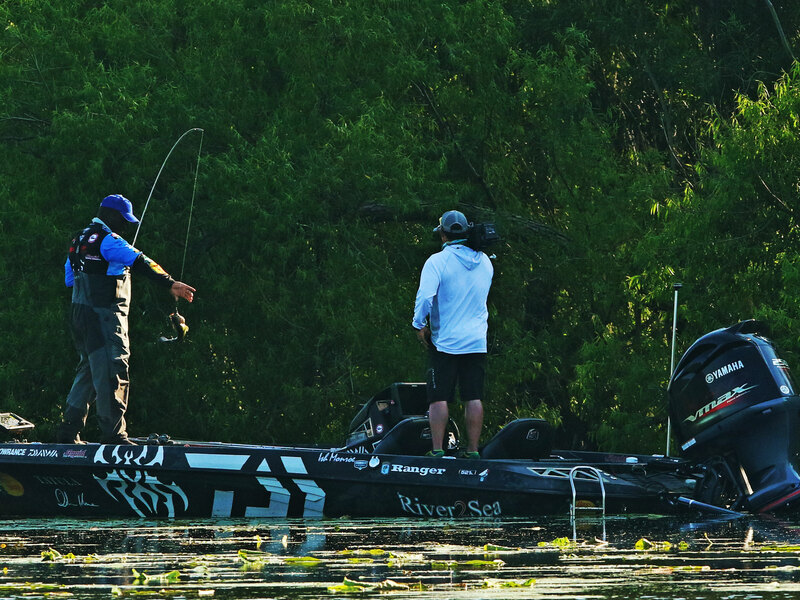 Monroe fished his first tournament at 14, bought his first bass boat at 17 and turned professional the following year. He competed through high school and while earning an associate’s degree in marketing at Contra Costa College in California. It’s a course of study that serves him well in the bass world, where professional anglers are expected to plug their sponsors — Monroe’s include Yamaha Motor, Ranger Boats, Daiwa rods, Missile Baits and Bass Pro Shops, among others — during every public utterance. Ish Monroe (left) has stated he plans to retire from professional bass fishing when he turns 50, but those who know him best believe otherwise. His parents wanted him to pursue a regular job and fish on the side. “My dad wanted me to be a fireman because the schedule, a couple days on and a few days off, would have let me compete,” Monroe said. But once he started cashing checks and appearing in magazines, they stopped questioning his full-time commitment to the sport. A few minutes before dawn on the first day of the Sabine River competition, Monroe was idling his boat just off the docks, where a few dozen devoted fans had gathered to mark the start of the tournament. Larger crowds would come later for the afternoon weigh-ins, food concessions and musical acts. The anglers were released seconds apart. Monroe was second to last, but the randomly drawn order would be reversed on Friday to make up for Thursday’s disadvantage. At his disposal was the entire 510-mile river, save for the Louisiana shoreline — thanks to that state’s idiosyncratic laws, dating to the Napoleonic area, that extend homeowners’ property rights to the water — plus hundreds of additional miles of reticulated tributaries. Some anglers ran their boats, which are capable of going 75 mph, more than 100 miles to the outskirts of Houston before settling into fishing spots. But not Monroe. “I like to do more fishing than running,” he said. Like prized jewelry, fishing is passed down through the generations. He gunned his boat south on the main river for less than five minutes before settling next to the bank and selecting one of several rods, each with a different lure, that were latched to the top of his boat. Another dozen or so were ready in below-deck compartments. 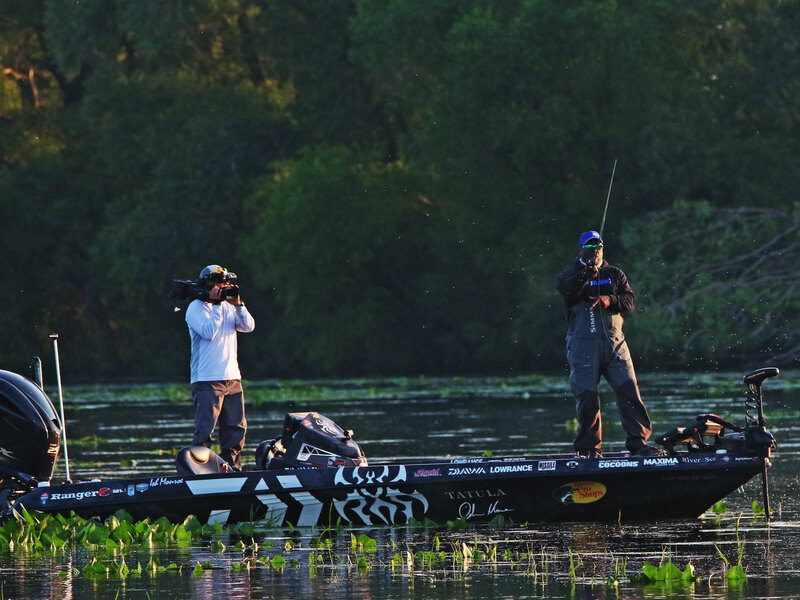 Aside from television camera operators — BASS provided livestreaming of the event online, and highlights were broadcast later on ESPN3 — press isn’t allowed on the boats during competition days. The extra seat is reserved for “marshals,” volunteers who ensure the anglers don’t cheat by stuffing a lead weight down a bass’s throat or fish in prohibited areas. The anglers are also subject to random polygraph tests to ensure they’re not seeking tactical advice from social media reports on promising areas. I followed Monroe from a distance in a media boat. Despite his three days of scouting, over the next half-hour he had only one bite — a bass much shorter than a foot, so he tossed it back into the river. He gunned his boat to another spot, and another. After three hours, he had two small fish weighing a combined two pounds. Still, every angler has bad days. And on that Thursday, Monroe struggled. He made his limit of five fish but they were small, weighing a combined 7 pounds and 8 ounces, less than half of the 16 pounds and 3 ounces bagged by the day’s leader, Louisiana’s Greg Hackney. After the first day, Monroe stood in 67th place. 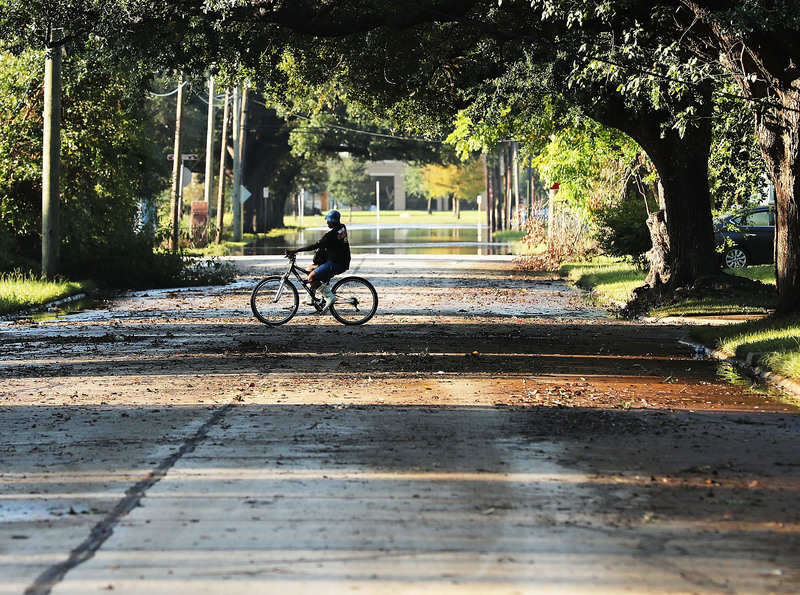 A man rides a bike through Orange, Texas, on Sept. 7, 2017. Orange’s population of 20,000 is one-third African-American, but only a handful showed up at the Elite competition’s weigh-in ceremony. Even though African-Americans constitute about a third of Orange’s nearly 20,000 residents, only a handful were among the several hundred fans who showed up for the weigh-in ceremonies on Thursday afternoon. Regardless, Monroe was well-received and at ease, posing with school-age kids for photographs and signing memorabilia. Although Monroe and I had seen a couple of recreational boats flying Confederate flags on the river during Wednesday’s practice session, sightings that went unremarked by Monroe, at the weigh-in there were no Confederate flags or other white supremacist iconography that can be found at NASCAR events. While bass fishing may always be linked to the Deep South, it has spread culturally and geographically. The Elite tour makes stops in New York, California and Michigan, and three competitors on the tour hail from Japan; Takahiro Omori, the most successful of his countrymen, won the 2004 Bassmaster Classic and an Elite event earlier this year. A couple of weeks after the Sabine event, I spoke with Mark Daniels Jr., the only other African-American currently on the Elite tour. Like Monroe, Daniels had grown up in San Francisco — their fathers fished together. Daniels also had fallen in love with fishing as a toddler, but unlike Monroe he first pursued a more conventional career. He studied agricultural biology in college and worked for the state of California in an agricultural field position. Daniels fished on the side but in 2013 started having more and more success. He qualified for the Elite tour in 2016 and now is a full-time angling professional based in Alabama. “Most folks are fishing to eat,” and bass aren’t prized for their taste, said Isaac Payne, an African-American ex-Marine who founded the Savannah School of Art and Design’s men’s and women’s collegiate bass fishing teams. “When you’re bass fishing, you’re thinking about fish care and preservation, and that’s something that’s learned,” he said. The increasing number of college angling programs — they began in the 1990s and now number more than 600 — should help diversify the sport, said Dave Precht, editor in chief of Bassmaster magazine. Payne brought an African-American student, C.J. Guest, from North Carolina to his school on scholarship. Guest was the only African-American on the team, which had about 10 anglers. “I had seen him compete at the national BASS high school championships,” where Guest and his partner finished ninth among 175 teams, Payne said. But Guest also was a soccer standout, and after a year at Savannah, he transferred to pursue that sport. Despite finishing in 67th place on the first day of the tournament, Monroe won the 2018 Bassmaster Elite at Mississippi River to take the $100,000 prize. Daniels also failed to make the cut. Hackney, the Day One leader, held on to win the event. But then, just like that, it is. A week after failing to cash a check in Texas, Monroe competed in an Elite event in Wisconsin on the northern stretches of the Mississippi River. His tournament was almost derailed on the first day, when he got stuck on a sandbar. “I’d never been stuck like that, going 50 miles an hour to zero in a couple of seconds,” he said. He was fortunate to dislodge his boat at all. Still, the effort sucked up valuable competition time, forcing him to stake out a different spot than he had originally intended. It is hoped a younger generation has taken note: For two weeks this summer, one of the whitest of American professional sports tours was dominated by its only African-American participants.